Greetings shoppers! If this backdrop looks a little different than my usual one, it's because I'm actually currently in the USA visiting family. I had a quick minute to take these snaps to show you my new Michael Kors jacket. And by new, I mean that I found it on Ebay. So you know..."new." 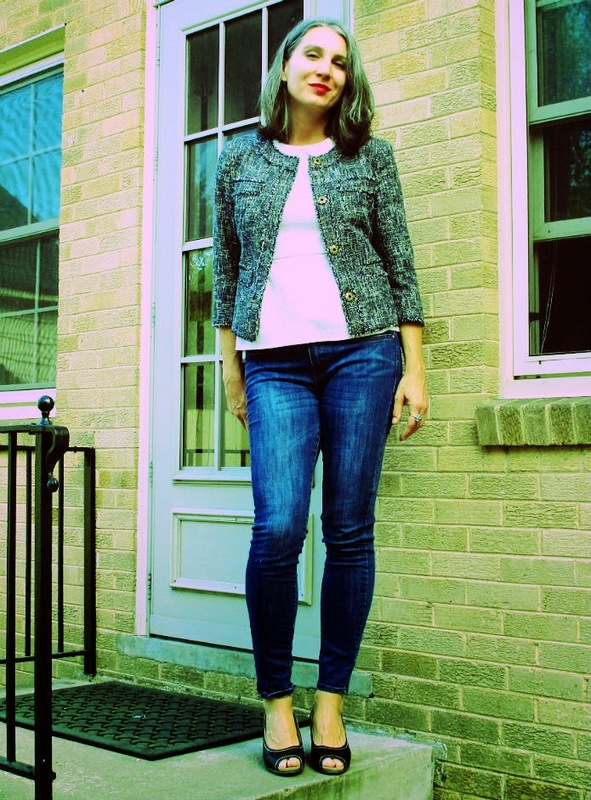 I've always loved a bouclé jacket, and this one is a perfect fit (luckily, because as we all know, with Ebay you're buying something you haven't tried on). I see myself pairing this with ripped-up jeans, or even shorts...basically all manner of things I didn't bring with me on this trip. I think it's important with bouclé to not style it too...Madame (to once again use Kors' own phraseology). Right. I'm off. There's thrifting to be done here and happily, it's actually a little too hot for this jacket today. Nice look, and wonderful jacket, I like the fabric and design. I love ebay too, for selling as well as buying, a couple of times a year I purge my wardrobe, which feels good. And each time I vow never to make the same purchasing mistakes again...this is a great jacket and love the relaxed styling. Love, love, love this bouclé jacket. You can't go wrong with a bouclé jacket, especially if it's a bargain from ebay! And this one is so easy to either dress up or dress down as you've effortlessly shown here. Another great jacket to keep your 'I'm so fancy' Alberta Ferretti one, company from last month. I had serious jacket envy over that one! Hope your having fun with family! I love to shop on Ebay and other online stores. Great find, and it looks great with the skinny jeans.